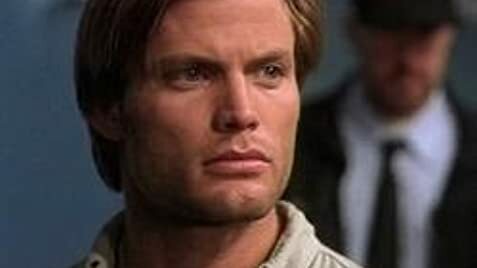 Casper Van Dien breaks a new record in looking shabby in this movie, although he is supposed to be a marine biologist. If you can buy that, you will probably be able to handle the rest of the movie as well. "Shark Attack" tells the story of Van Dien going to South Africa (where just about everyone seem to be a hustler), to look for his missing friend. He finds out that his friend became shark food, and tries to find out why the sharks have started to behave so aggressively in this particular area. He gets help by another expert, Corinne, who loves to run around in her bikini while trying to solve the case. If you are looking for really bad acting, check out "Shark Attack". You won´t believe your eyes. The effects are awfully lousy, unless you find rubber sharks convincing. The script contained so many old cliches that I lost count of them, and that is not too good. Right from the start it is quite obvious who is good and who is evil. These kind of films can be so bad that they become entertaining, but "Shark Attack" is not fun at all. Man, I´d rather watch an episode of "Baywatch" than this kind of crap. Why somebody felt it was necessary to make a sequel to "Shark Attack" I have no idea. Jenny McShane appears in the 3rd Shark Attack movie, but plays a different character. Dr. Miles Craven: See! I told you I wasn't such a bad guy. When Corinne looks down the microscope, she says that there is a hormone in the unusual-looking cell. You would not be able to see a hormone through a microscope and the cell is quite clearly a normal-looking eosinophil. No Sharks were damaged or destroyed for the filming of this movie.